As we found out when we asked the MEL staff last year, red flags in relationships run the gamut from ungrammatical texting to being a frequent wearer of boat shoes. In reality, most of us have a range of red flags, running from those that scream red to others that are less stop signals than they are yield signs. But perhaps the most cited common red flag is jealousy. So let’s say you’re in relationship with the jealous type — someone who sneakily reads your text messages when you leave your phone out, or tells you that you need to send them an update every hour on the hour when you’re out with friends — and you’ve decided that, despite their behavior, this is the person for you. How concerned should you be by their application of surveillance-state tactics in monitoring your IG account? First, it’s important to note that there are two schools of jealousy thought, and some people seem to think that a little bit of jealousy is not such a bad thing. “In the case of romantic relationships, having a ‘jealous partner’ can give some people a ‘charge,’ as it makes them feel sexier knowing that their partner might think someone else is attracted to them,” writes Suzanne Degges-White, a licensed counselor and professor at Northern Illinois University, for Psychology Today. But as per another redditor responding to his question, jealousy isn’t a sign of love or affection: Instead, it’s just a reflection of anxiety and insecurity. That brings us neatly to the more common assessment of jealousy as a form of hemlock for what might be an otherwise healthy relationship. According to a 2016 Bustle article, there are severals signs to watch out for when it comes to a jealous partner. One of them includes wanting you along all the time. “It can feel romantic and passionate when your partner wants to spend every waking moment alone with you, especially when love is new, but that kind of intense isolation is often a red flag,” Esther Boykin, a marriage and family therapist and relationship expert, told the women’s site. “Unhealthy jealousy rarely looks unhealthy in the beginning; it often looks loving, passionate and exciting — they can’t get enough of you, they love you so much that they just want you all to themselves,” she says. So the question then becomes, how big of a red flag is jealousy early on, on the scale of “let’s talk this through” to “I’m dating an axe murderer”? “Little pangs of jealousy aren’t an issue,” says Amy Kim, a clinical psychologist in L.A. “But if someone is acting on their jealousy and invading your privacy, then it’s definitely an issue that has to be talked about very openly.” In other words, it depends both on the scale of the feelings of jealousy, as well as a couples’ willingness to work on the issue. As discussed in an article in Luvze, a couple who communicates about their feelings of jealousy is more satisfied in their relationships than those who act distant or avoidant. 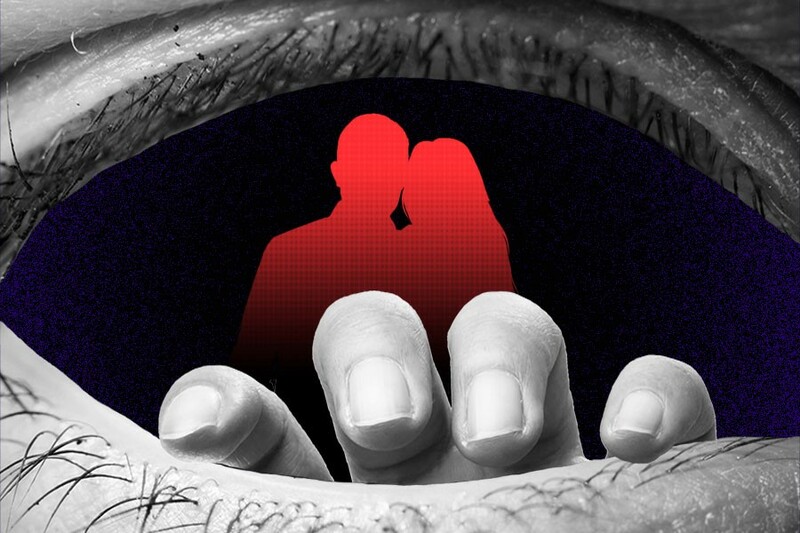 What worries us, of course, is the possibility of unfounded jealousy turning into something even worse: The jealousy-fueled violence that’s a common trope in thriller movies. Despite this trait often being ascribed to female characters, in the real world, it’s more often men who tend toward such acts, like this harrowing case from earlier this year in which a man murdered and then dismembered his girlfriend. “The man, 28-year-old boxing coach and former mixed martial arts fighter Gary Chu, is believed to have murdered Ms. Huang I-Min for lying to him about her virginity, reported local news outlets. The pair reportedly met on the mobile dating platform Tinder,” reported The Straits Times. While there’s no exact data on how common it is for jealousy to turn violent, a 2012 study from Ohio State University on couples in abusive relationships found that a long-term dispute regarding infidelity permeated nearly every relationship the researchers looked at, and was most often the catalyst for violence. “Even if it didn’t trigger the violent event, it was an ongoing stressor in nearly all of the 17 couples we studied,” one of the researchers told Live Science. So what causes these unfounded bouts of jealousy, if you yourself have given no indication that you’re likely to cheat? For some, it’s simply a case of jealousy spilling over from a past toxic relationship. Such a situation is put forward by one panicked redditor who thinks her boyfriend might fall in love with a girl who’s better than her anytime he’s away from her. “Dealing with relationship anxieties and feelings of inadequacy in new relationship. Scared he’ll realise he can do better while away at school. Lack of adequate daily contact and him off partying causes fear. Though he’s never given me any reason to doubt him. How to get these under control?” she writes. While her reasoning isn’t completely unfounded — her boyfriend isn’t great at staying in touch while he’s away from her — according to Kim, this is a common form of unprovoked jealousy that can ruin a relationship if both parties don’t talk openly about it. “It requires self-honesty on the part of the person who’s jealous,” says Kim. “But it’s also important for both parties to communicate openly about issues that cause them to feel anxious and jealous.” Additionally, she says that the jealous person has to be willing to examine their issues with individual therapy in order to understand what the feelings of jealousy are about. “Because that’s a separate issue,” explains Kim. So again, like most other red flags, jealousy isn’t a deal breaker per se, but it’s definitely a warning sign that shouldn’t be ignored. Unlike boat shoes, which is a flagrant foul and should be enough to send you running for the hills.